Just want to repeat the words of Phoenixfirebird Self-Care is more important than ever~! December 3, 2014 Articles & Updates Sandra Walter No Comments. One of the most central mind control pattern has been to simply reverse everything and get people under the illusion that bad things are good, and good things are bad, that they love hate and hate love, at least on a subconscious level. This pattern has gone so far that at this point most people don’t even realize how much it affects them. The most obvious place to encounter this programming is in the movie business. Horror and other dark occurings are presented in a cynical way and considered to add interest to a story, in fact it has become quite unconceivable to imagine a story without these things, it would seem boring and useless. In this context seeing pain on the screen (and then in real life) has become funny, and loving and peaceful attentions become ridiculous. This deeply affects people’s sense of imagination and therefore also their choices and what they manifest as creators. This enforces a Stockholm syndrome where people think they love their enslavement and lives of suffering, or at least agree to it to some degree. This has disconnected people from what a normal life in connection with Source/creator really is. Imagine a life where suffering is not part of a good and fulfilling adventure. Where everything that is needed is being unconditionally given moment after moment, generating an unlimited spiral of evolution in happiness and bliss. The development of the human spirit has three stages. This development begins with sepatazed ego, “me” and ends in the free space of Consciousness. As we accelerate at faster than light speed toward fifth dimensional frequencies and higher, new chakras are opening that may cause panic as resulting ascension symptoms appear. 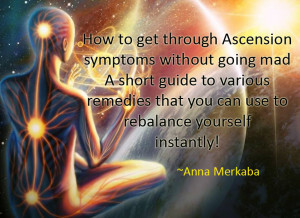 In order to recognize when bizarre pains and memory loss could be related to ascension, it is wonderful when people share their experiences for the rest so that we can compare and get confirmation. Minor chakras are being activated and if energy cannot move through the chakra, the body will provide a clue in the form of pain or discomfort to let us know. Just a few days ago, I woke up with severe pain on the ball of my right foot, making it difficult to walk. It felt like a severe stone bruise or even gout for those who know what that is like. I knew it was related to the huge energy surges we had been receiving, so I took a hot bath and massaged the area. I expect that it will be a temporary thing because of the confirmation I found. Headaches can be extreme. Dreams can be quite lucid, and/or bizarre. Ask your medical team to assist, (yes you have an amazing one), if the pain gets too severe, you can ask your higher dimensional self to pull your avatar so you can sleep quickly. We feel the most extreme physical pains so that the awakening collective won’t have to do so. This is the soul contract we agreed to as forerunners. It is a great honor To be at the forefront of embodiment. Our nose, ears, throat and glandular chakras are coming online. We get ultra sensitive to sound and can hear every little thing. Our nose chakra as well, for all frequencies correlate to a smell. If you smell something foul, you are in a descension 3/4d Timeline. Be aware. Also, the nose can begin running at the weirdest times… and hacking from the throat is also common. Like a cat…hairball…hack hack hack. All these new chakras are being activated by incoming Galactic Source Energies in synergy with our Sun. It is all divinely perfect. As our Heart Chakras expand to the new NEON chakra system of 5d there can be fluttering and sometimes sharp pain. Breathe and tell your body all is well, for indeed it is. Our Hand and feet chakras are also activating. As our hands activate there is sweating and burning. Eventually they feel as if your are wearing a golden second skin or gloves. Our feet chakras activate as well so we can anchor to the Planets higher vibrational grids. Again, sweating and burning is present. This also confirms some dreams I had about being in class preparing for my telepathy to come online. I was shown what it was like to hear everyone’s thoughts (it was very loud), and then the instructor “closed the classroom window” and quieted all of the noise. We were learning how to turn it on and off, and how to deal with negative thoughts that were given out by unaware people. In a dream before that, I had been moving boxes of people’s things from one “ship” to another, like being at a port. In the one box I must had had knowledge and things learned that a person no longer needed anymore, and in my dream it was a box of fruit & vegetables. There was a big red juicy apple on top, and I took a bite. Another friend, Tiffany Stiles, went to eat with a friend recently. When her friend got up to go to the bathroom, some people randomly sat down at her table. She said hello to them and they ignored her. After a few minutes, she realized that they couldn’t SEE her! “As we have gone through this last shift, and increased in frequency more, we are becoming invisible (shifting to higher dimensional frequency) to those who are vibrating at much lower frequencies. I was out catching up with a friend. The friend got up from the table to use the restroom. In the meantime, two people just sat down at my table with me sitting there. I had no idea who they were. I said, good evening, how are you this evening? They didn’t respond, and looked as if they were looking right through me. Wayshowers can experience many symptoms and waves of energy for others as Maria mentioned, however be aware that many other bizarre things are occurring as timelines rapidly shift toward the bifurcation or separation of worlds. A friend of mine had a client who said that she had just had a session with me, when I hadn’t had any sessions in two weeks. Another friend of mine got into a little argument with her mom over a Facebook post her mom said that she made when she had de-activated her account and knew she did not make any posts. Furthermore, some people are being moved out of your reality and others are losing their memories as a part of the compassionate plan of relocation on timelines. He said he felt very odd and looked around my living room as if he had never been there before. He did recognize me, and my cat, but did not know the day of the week or the date. He asked me about that repeatedly. Somewhat alarmed, and worried about a stroke or TIA, I took him to a hospital. He was admitted and has a CT scan and an MRI. Nothing was wrong. He was told it might be ‘transient global amnesia.’ The whole episode only lasted 10 or 15 minutes…oddly, another friend reported that an acquaintance’s husband was admitted to another hospital with the same thing last night… thoughts? “Transient global amnesia is a sudden, temporary episode of memory loss that can’t be attributed to a more common neurological condition, such as epilepsy or stroke. During an episode of transient global amnesia, your recall of recent events simply vanishes, so you can’t remember where you are or how you got there. In addition, you may not remember anything about what’s happening in the here and now. Consequently, you may keep repeating the same questions because you don’t remember the answers you’ve just been given. You may also draw a blank when asked to remember things that happened a day, a month or even a year ago. With transient global amnesia, you do remember who you are, and recognize the people you know well. But that doesn’t make your memory loss less disturbing. c) if there is some kind of help from the angelic and galactic team to re-insert memory for those who need to be able to function in realities until they bifurcate. The purpose of sharing this information is to reassure you that new things come up rapidly that may take us off center if we go into fear. It may save you a trip to the hospital or emergency room if the symptoms happen to you and you are able to go within and ask whether this is energetic related and will pass. If you are responsible for another person, as Janice was, and especially if it involves memory loss, it is a tough call as to what to do, but you always feel safer when seeking professional help. It also helps the rest of us when you report what the results were from the symptoms and the information gets shared.